Remove excess solder from plated holes using a vacuum desoldering tool. Remove excess solder from surface mount pads using a solder iron and solder braid. Remove excess solder from surface mount pads using a vacuum desoldering tool. This procedure covers the basic concepts for preparing circuit boards and soldering tools for soldering and component removal. Refer to 7.1.1 Soldering Basics before proceeding. Figure 1: Remove excess solder from plated holes using a vacuum desoldering tool. Figure 2: Remove excess solder from surface mount pads using a solder iron and solder braid. Figure 3: Remove excess solder from surface mount pads using a vacuum desoldering tool. Silicon based lubricants or hand creams should not be used on or near surfaces to be soldered. 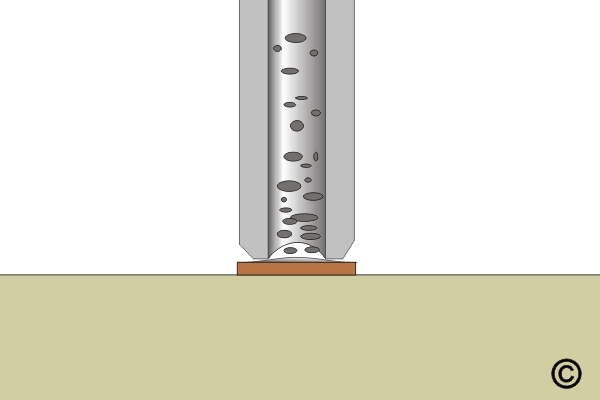 The size and shape of the soldering iron tip will have an effect on the rate of heat transfer. Larger tips with more surface area will transfer heat faster than smaller tips. Tip size is based on the size of the component. While there is no exact rule about how the size of a soldering iron tip should compare to the size of the termination, if the tip extends too far beyond the edges of the joint, it could come in contact with another component or the surface of the board. Where possible, the width of the soldering iron tip should be slightly smaller than the width of the pad. The size and shape of the component removal tip will have an effect on the rate of heat transfer. Larger tips with more surface area will transfer heat faster than smaller tips. The smallest tip should be selected providing that the tip fits over the component lead and allows room for molten solder and air to pass through it. The outside diameter of the tip should not cover the pad completely or touch the circuit board base material or solder mask. If the tip extends too far beyond the edges of the joint, it could come in contact with another component or the surface of the circuit board. The smallest tip should be selected providing that the proper air flow is delivered to the leads and solder joints. 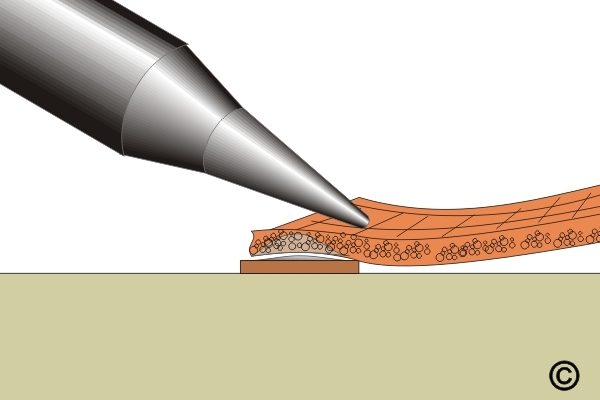 If the tip is too large it may extend beyond the edges of the component and cause reflow to adjacent components or burn the surface of the circuit board. The smallest tip should be selected providing that the tip fits over the entire component and contacts all the leads evenly. If the tip is too large it may extend beyond the edges of the component and contact another component or the surface of the circuit board. If needed, circuit boards should be cleaned prior to soldering and component removal operations. Oxidation and contamination should be removed by methods that do not damage leads or parts, and do not cause contamination or hinder solder wetting. If required, circuit boards should be baked in a suitable oven to remove any absorbed moisture. Time between bake and soldering should not exceed 5 days, depending on atmosphere humidity levels. Temperature and time of baking is to be determined on individual basis. If needed, tin component leads prior to soldering. If needed, reform component leads or replace the component if the leads do not meet the specification required. If a component was previously soldered at the rework location, some of the original solder will remain attached to the pad. That solder has already been heated twice. 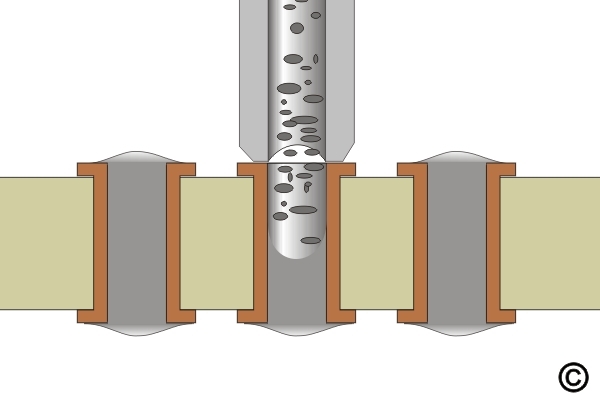 If it becomes part of the new solder joint, it will have been heated at least three or even four times. Reheating solder three or four times - even with the addition of flux - may affect the physical composition of the metals. Every time that solder is reheated, the molecular structure tends to become increasingly brittle. Solder needs to remain ductile in order to absorb the stresses of expansion and contraction caused by heating and cooling. Old solder should be removed and replaced with new solder whenever a component is reattached. Excess solder in a plated through hole or excess solder on surface mount pads may interfere with the proper placement of the new component. Solder removal by wicking is not recommended for removal of solder from a plated hole. A powered vacuum desoldering tool is recommended. The powered vacuum desoldering tool has a heated tip with a hole in the center to vacuum melted solder away. There are different tip sizes depending on the size of the job. The diameter of the tip should match the width of the pad. A larger tip will extend over the edge of the pad and could potentially burn the board. If needed, clean the area. Inspect the hole. If there is not sufficient solder covering the pad to provide for proper heat transfer, the hole should be filled with solder. Filling the hole improves the thermal linkage between the desolder tool tip and the solder in the hole. This ensures a rapid melt and reduces potential for pad or hole damage. Place the heated desoldering tip onto the pad until you feel the solder melt. Do not apply any downward or sideways pressure on the pad. It should only take a few seconds for all of the solder to be removed. After the solder is vacuumed from the hole, lift the tool. Continue the vacuum for an additional few seconds to make sure that the solder has had enough time to travel through the tip into the storage chamber. If needed, remove solder from the remaining holes so that the component can be inserted without force. Solder Braid is made from stranded copper with a powdered flux inside the copper strands. Solder braid will absorb the solder when heat is applied to the braid and solder surface. Solder braid comes in different widths. Select a size that matches the width of the pad, or just slightly smaller, where possible. Most solder removal braid comes with a powdered flux inside the copper strands. Adding additional flux will help to transfer the heat faster and helps to improve the wicking or capillary action of the copper braid. Select a soldering iron tip to match the width of the pad. It the tip is too large for the braid, it will hang over the edges and could burn the board or the solder mask. If the tip is too small, it will take much longer to heat up the braid. Add a small amount of liquid flux to the braid. Place braid over the pad and rest the iron tip on the braid. (See Figure 2) As you apply the heat, it's important to avoid putting any downward or sideways pressure on the pad, since the adhesive resin underneath the pad is being heated at the same time. Adhesion between the circuit board and the pad is at its weakest when heated. Sideways pressure against the pad can lift the pad off the circuit board surface. The weight of the soldering iron should apply sufficient contact to quickly heat the solder braid. The heat that passes through the braid should melt any solder that remains on the pad within a few seconds. The wicking action of the copper will draw the solder away from the pad. This wicking action should be visible. When the wicking action stops, remove the braid and the iron. The used portion of the braid should be clipped off and any other pads should be prepared exactly like the first. Apply a small amount of liquid flux to the pad. Place the heated tip onto the pad until you feel the solder melt. Do not apply any downward or sideways pressure on the pad, the weight of the hand-piece tip is sufficient. It should only take a few seconds for all of the solder to be removed. After the solder is vacuumed from the pad, lift the tool. Continue the vacuum for an additional few seconds to make sure that the solder has had enough time to travel through the tip into the storage chamber. Any other pads should be prepared exactly like the first.